As many of my readers know, I am not a full-time artist. I am an ordained American Baptist Minister. This means that some weeks (like last week) are very busy for me with church and church activities. Last week was Holy Week and I was crazy busy! However, I did manage to squeeze in about 6 hours of work in my studio last week. 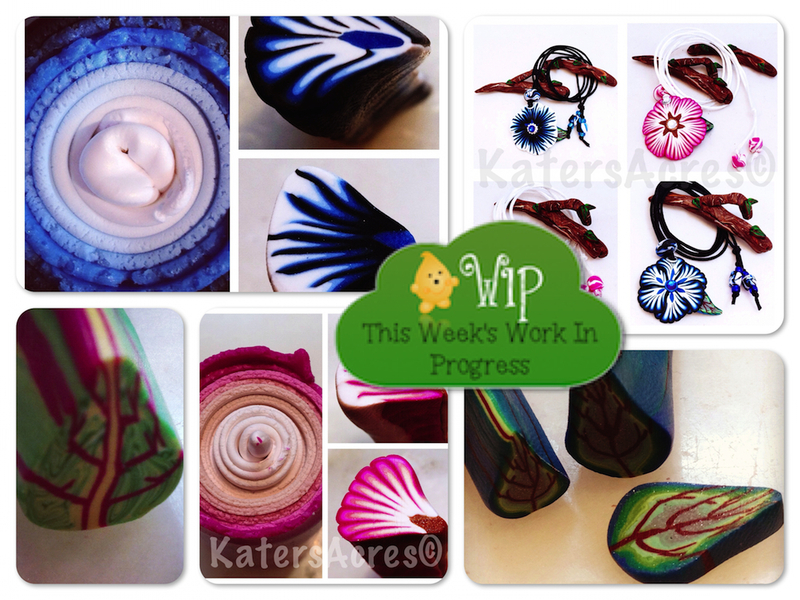 Working in my polymer clay studio always seems to just melt all the stress away, and last Friday was no different. If you follow my WIP Wednesday posts, you know I have been working at a lot more than just Parker lately. Because of my two very large craft shows in July & August, I don’t have a lot of non-Parker related inventory left as I have sold most of it in last year’s craft show. Because of this I have been working hard to try and boost that inventory, this Spring’s major project has been flowers (of which I’m using the scraps to make bugs brooches). Here’s just a few samples of the 4 kinds of flowers I made this past week. The hardest part of making these lovely flowers (in my opinion) is that I always have to keep one of each one I make for myself. I’m addicted to them and have a giant inventory of them in my closet to match with my outfits. Do you do this too or is it just me? Let me know in the comments below. One of my favorite tricks that I do with Skinner blends is the 2-in-1 flower petals. Basically you make one large skinner blend. The Skinner Blends shown at the left & right here have 3 colors each. Once I make the brushstroke canes, before I shape them, I cut them in half. One I manipulate to put the white on the inside, the other with the white on the outside. This creates 2 different, yet similar petal canes. It’s like a 2-in-1. I make all my petal canes like this now because I like the color variation. GET THE TUTORIAL HERE. Lesson Learned: Thou shalt not sneeze while playing with glitter. The results are … pixie dust everywhere! I’m totally in love with the necklace featured on Polymer Clay Daily this week. I’m not really a jewelry wearer (except my flower necklaces) but I tell you, I could really see myself making this stunning beauty. Istagram: I’m really enjoying connecting with other clayers on Instagram. Be sure to follow me here. I post pics of my studio work, but also my life in general. If you’re expecting 100% clay, you won’t get that there. If that’s what you’re looking for, check my FaceBook instead. Feedly: This past week I added a “Follow me on Feedly” icon to my website. If you use Feedly, just one click on the icon will allow you to follow this blog instantly! I’m new to your site here,and I love your 2 in 1 flower cane.I can’t locate the tutorial on it though. Can you direct me? Great Cindy! I can’t wait to see them! I would love to see how you do that 2 in 1 petal cane as well, that is just beautiful! Hi Karen! I will write up a tutorial to post next week on Tuesday. Come back then and you will see! Thanks Katie. Would you explain what you are doing to get these two brushstroke cane variations? I often cut my blend in half, rolling one part lightest to darkest and the other part darkest to lightest. From there I can cut the rolled blend into quarters and proceed. Your method intrigued me. Hi Laura, I sure can. I will do a mini tutorial on it, as I need to take pictures to show you as well. I will get a post up soon, thanks for the request!